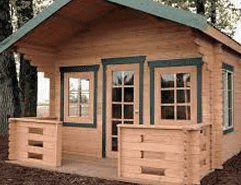 How to Build a Shed: OK, so this page is dedicated to showing you in a general way what you need to do step by step to build a shed. 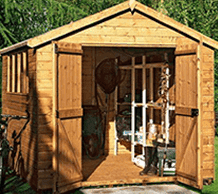 All sheds MUST have a strong base, if you want to read our guide on how to build a shed base then that would be a good starting point before you read this guide. Over the years this page has been live, a few of our readers have emailed us and asked us if we could provide some more specific step by step instructions that would help them build a more sophisticated shed. In response to that we have teamed up with the professional carpenter and pro shed builder Ryan Henderson. The plans Ryan uses are ones that many “professional” carpenters currently use when building bespoke sheds. .Ryan has produced a really amazing step by step resource called MyShedPlans where hundreds of different designs are available all with an easy step by step instruction. Having been featured on many US specialty TV channels for his shed building skills, we really feel happy in pointing you in his direction. Below are just a few examples of some of the designs that Ryan has on offer. The below guide, while not as in depth as those we talk about above, should however be fine if you are just looking at building something that is fairly simple and basic. If you feel like you would like to have a more in depth step by step guide then we can’t recommend the MyShedPlans highly enough. OK, so on to the WhatShed step by step guide on how to build a shed. Though the actual building of a garden shed will take more time than the construction of a foundation, it’s without a doubt a much more enjoyable part of the construction process. Watching your very own shed rise up from the ground offers a thrill rivaled only by gazing upon the finished product in its entirety. To keep everything simple, this guide will assume that the shed being built will have a concrete-slab foundation. Though there are other types of foundation—including sunken pillar and wooden skid—we have a concrete slab foundation guide already in place. Now, for those completely uninterested in the laborious endeavor of building a shed from scratch—never fear!—there are several pre-fabricated kit options available. These kits typically come with step by step instructions and all the necessary construction materials pre-cut and pre-labeled. Sure, these kits take some of the fun out of it, but they can be a great time saver for those unaccustomed to working with their hands. Still, it’s hard for anything to top the sights, smells, sounds and memories that come with a from-scratch build. Before going any further, the acquisition of a few basic tools is absolutely paramount to successfully erect a custom shed. An array of fasteners—nails, screws, etc. Although they’re great from a convenience standpoint if already in your toolbox, things like a nail gun or a jig saw are not absolute necessities, so don’t feel the need to go out and spend money on elaborate power tools. Unless working with a massive budget and a great-deal of construction experience, the chances are this shed will consist of wood more than any other building material. Sure, steel and composite materials are great if you’re building a skyscraper, but for the purposes a small backyard structure it’s just a tad excessive for most circumstances. Having said that, choosing the right lumber can make or break a project before it ever gets started, so examine this lumber guide to fully understand the finer points of your main construction material. More than anything, just ensure the purchase of straight, tight-grain wood and make sure anything touching the concrete slab or surrounding ground has been fully pressure treated, specifically for ground-contact. Long-term, it will be worth the up-front cost. As for how much lumber will be necessary, that’s difficult to say. Depending on the size of the structure, it could be quite a lot, so take the measurements of the foundation to the local lumber yard and talk with them about the details of the project. In all likelihood, they’ve helped customers with similar builds before and will be able to provide accurate estimates. 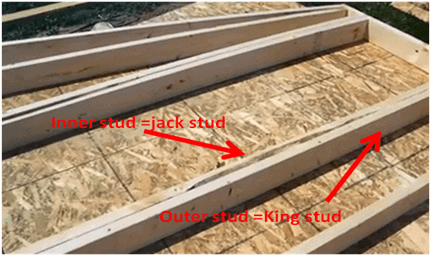 Additional Perk: If you know the measurements of your foundation and the desired height of the shed, your lumber provider can cut all of your boards, studs and headers to length, which will massively shrink down on prep time. Also, expect to purchase mainly 2×4’s and 2×6’s assuming your project is of relatively basic size. Since the beautiful concrete foundation—complete with anchor bolts—has already been poured and set, it’s time to resume building. Start by laying your mudsill (sole plate) next to the anchor bolts sticking out of the foundation. With the measuring tape and carpenter’s pencil, make a discernible tick mark 1 ½ inches from the end of the board, continuing the marking every 16 inches until reaching the end of the board. These marks will serve as indicators for the studs. Also take care to highlight—using a different mark or indicator than used for the studs—where the anchor bolts line up with the mudsill. Take your studs and—using the marks you’ve made as directional indicators—secure them to the mudsill by driving a galvanized nail or screw through the board and into the center of the stud bottom. At this time, also drill holes into the mudsill for the anchors. The holes should be large enough to let the anchors to pass through, but not gaping. Now complete, align the drill bored mudsill (with studs attached) on top of the anchor bolts and set down onto the slab. The raising process can be particularly difficult if working alone with a large wall frame, so it may be necessary to get an extra pair of hands to help. Though it would be easy to say “repeat the above process for the remaining three walls”, one of those walls will need to have a door if you ever want to actually go inside of your shed, so at least one wall cannot identically adhere to the instructions above. Much like a shed, the avid builder can happily build his own door, but often times it’s quite a bit easier to go with a manufactured door from the local hardware store. The only problem is, manufactured doors only exist in specific sizes, so proper planning and measurement are critical when setting about construction of that fourth, final wall. The insertion of the door will mean the loss of at least one support stud. To compensate for the structural loss in the wall, installing a header immediately above the top of the door will help bear the weight of the roof. The header can either sit on jack (trimmer) studs—additional boards secured to the king studs—or a framing connector (like a post anchor or joist hanger), though jack (trimmer) studs are more common and easier to install. A cripple stud—usually a pair of 2×2’s or a 2×4—will run between the header and the top plate. Pro Tip: Make sure the basic opening for any manufactured door is a ½ inch larger (in width and length) than the purchased unit. The extra room will allow breathing room for any necessary adjustments and helps to ensure a flush fit. With all four walls raised and set on the anchor bolts, create a few temporary buttresses to keep them upright and undamaged. As this is temporary bracing that will eventually come off, don’t use expensive lumber—cheap greenwood or even damaged boards are fine. Secure the brace to the wall with a screw or nail and to the ground by weighing the free end down with a heavy weight like a bag of concrete. Pro Tip: For those up to going the extra-mile, secure the free end to the ground by driving a wooden stake into the Earth and nailing it to the brace board. The wall frames now secure and semi-sturdy, check the squares. Rather than measuring the diagonal from the top corner of one side the bottom corner of the other, use the 3-4-5 rule to check for 90 degree angles. Also, take the level and recheck the top plates as well as mudsills for consistency. Assuming square corners and level measurements all the way around, take the washers and nuts for your anchor bolts and secure them. Though the shed seems solid at this stage, don’t remove the extra bracing just yet. Lock the corners where the wall frames touch with extra framing, usually in the form of 2×4 blocks fastened to the two end studs. Install an extra corner stud to the filler block for added security if desired. 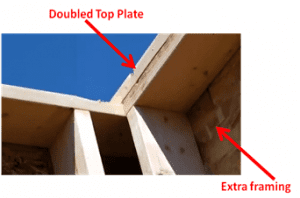 Double the top plate by taking additional boards measured to identically fit the existing top plates and secure them with nails or screw inserted every 8 to 16 inches. 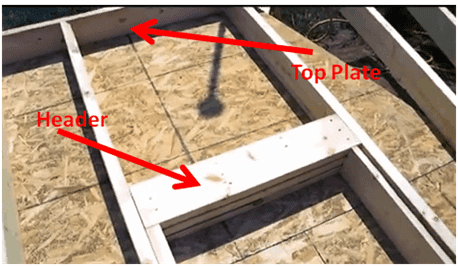 The addition of a booster plate helps to create a stronger, stiffer structure for the eventual support of the roof. Speaking of roofing, someone should probably address that. Yes, there are various kinds of roofs, but if this is your first shed, it’s probably best to go with a simple gable roof. For the unfamiliar, the basic gable roof consists of evenly spaced rafters secured to the top plates and the ridge board—which essentially serves the same purpose as a keystone would in a stone structure. The rafters will extend beyond the walls to form an overhang which will help protect the siding from excess moisture during the rainy season. Although there are three main types of rafter, in the interest of simplicity this shed will only deal with common rafters—boards of equal size and length placed at common intervals—normally 12 to 16 inches—along the length of the top plates and ridge board. If possible, set up the rafters so they sit directly over the wall studs. 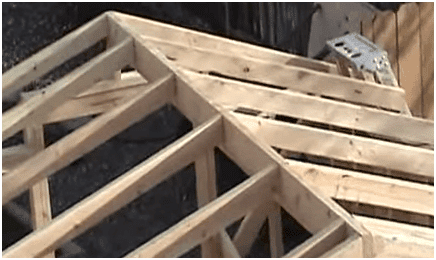 While the helpful hand at the lumber yard will probably mention this, it’s good practice to mention it again—make sure the ridge board is at least one size larger than the common rafters. 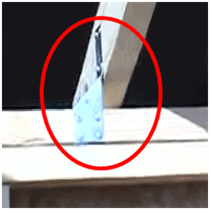 For instance, if using 2×2 rafters use a 2×4 ridge board. Know that the potential pitch of the roof (rise over run) is completely customisable. 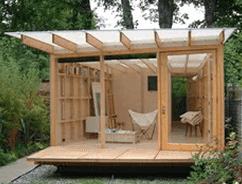 The steeper the pitch, the more challenging the construction—BUT—the more usable space the shed will ultimately have. 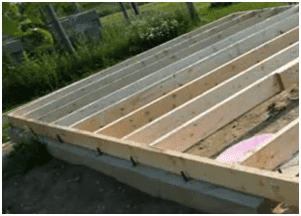 Again, as this guide is for a basic shed construction of modest size, there will be no joists. However, it’s important to note joists are absolutely indispensable for structures of a more pronounced size—for example a shed that could house a mid-size car should have at least a couple of joists running across the top plates. 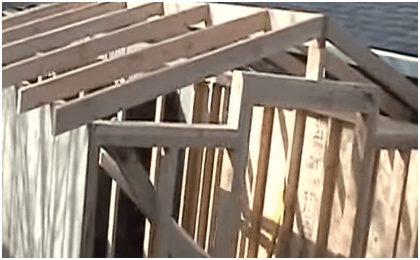 To properly install the roof frame, cut the common rafters—or have the lumber mill people do it—so the board fits flush where the wood meets the ridge board. Also notch cut the rafters with a 90 degree slot so they can stably sit on the top plates. 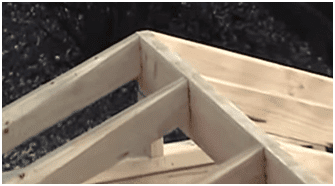 Pro Tip: Measure, cut and test a single rafter. Once confirming the test rafter properly sits on the top plate and fits flush with the ridge board, use it as a model for the rest of the common rafters. This will ensure that all cut placements and depth are identical. Take the first two rafters and secure them with a nail or screw to the first end of the ridge board. For those confused by the language, at this stage one end of the ridge board will still have nothing attached to it while the opposite end will have the basic slant-frame of your predetermined pitch. Repeat this process with the opposite end of the ridge board. 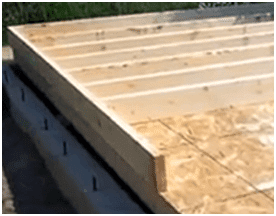 Once complete, have an someone help to lift the four-rafter frame onto the plating and then check for an even level along the set ridge board. Assuming everything looks good, begin installing the remaining rafters at their predetermined intervals. 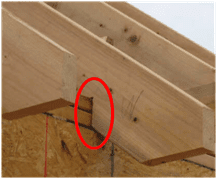 Don’t forget to safely fix the rafters to the top plates with framing connectors. Once the rest of the rafters are installed, climb down of the ladder and take a look at the handsome handiwork. This super structure is the backbone of your homemade garden shed. Thanks. We hope it helps. Remember measure twice and cut once and you can’t go wrong! Thanks, saved a lot of grief. Very concise and the pictures helped emensely. Hi Emma, if you look at the start of the article we recommend a company that supplies shed plans. You should give them a check. 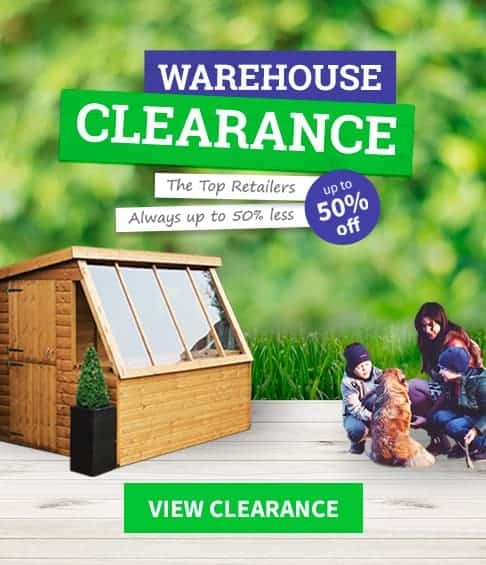 Hi, Is this a US site, despite being whatshed.co.uk? I am puzzled by the word ‘lumber’ where we in UK use ‘timber’. I am also horrified by the scale of the lumber recommended, as mostly 2×4 and 2×6. Lumber in US is MUCH cheaper than timber in UK, so we would try to use something smaller? 2×3 for studs etc. Many commercially bought sheds of good quality I’ve seen have used 2×2. It could be that the weather in US is also much more severe, depending on where you are, so perhaps you need to use 2×4? But thanks for the thoughts, I have picked up some useful ideas. Hi Robert, this is a UK/US page of the site. You can use something smaller in the UK if you want, just use the above as a guide rather than exact ikea like instructions.